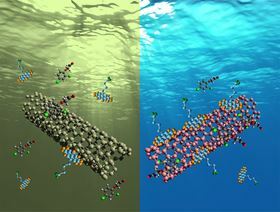 These images show how single-walled carbon nanotubes can filter dirty water. Images: John-David Rocha and Reginald Rogers. A new class of carbon nanotubes could make an effective next-generation clean-up crew for toxic sludge and contaminated water, say researchers at Rochester Institute of Technology (RIT). In a recent study, the researchers found that enhanced single-walled carbon nanotubes offer a more effective and sustainable approach to water treatment and remediation than standard industry materials such as silicon gels and activated carbon. They report their findings in a paper in Environmental Science Water: Research and Technology. In the paper, RIT researchers John-David Rocha and Reginald Rogers demonstrate the potential of this emerging technology for cleaning polluted water. Their work applies carbon nanotubes to environmental problems in a specific new way that builds on a nearly two decades of nanomaterial research. "This aspect is new – taking knowledge of carbon nanotubes and their properties and realizing, with new processing and characterization techniques, the advantages nanotubes can provide for removing contaminants from water," said Rocha, assistant professor in the School of Chemistry and Materials Science in RIT's College of Science. Rocha and Rogers are advancing nanotube technology for environmental remediation and water filtration for home use. "We have shown that we can regenerate these materials," said Rogers, assistant professor of chemical engineering in RIT's Kate Gleason College of Engineering. "In the future, when your water filter finally gets saturated, put it in the microwave for about five minutes and the impurities will get evaporated off." Carbon reduced to the nanoscale defies the rules of physics and operates in a world of quantum mechanics in which small materials become mighty. "We know carbon as graphite for our pencils, as diamonds, as soot," Rocha said. "We can transform that soot or graphite into a nanometer-type material known as graphene." A single-walled carbon nanotube is created when a sheet of graphene is rolled up. The physical change alters the material's chemical structure and determines how it behaves. The result is "one of the most heat conductive and electrically conductive materials in the world", Rocha said. "These are properties that only come into play because they are at the nanometer scale." "Once the papers are formed, now we have the adsorbent – what we use to pull the contaminants out of water," Rogers explained. The filtration process works because "carbon nanotubes dislike water”; only the organic contaminants in the water stick to the nanotube, not the water molecules. This story is adapted from material from Rochester Institute of Technology, with editorial changes made by Materials Today. The views expressed in this article do not necessarily represent those of Elsevier. Link to original source. Cleaning nanotubes through heat and ion bombardment.